Playseat® Office Chair - Black: the great looking sports chair that can be used for work and gaming! This seat is truly amazing. Not only do I get to enjoy the comfort of a Playseat chair, I get to use it while doing my work! This makes my daily activities so much more enjoyable and with Playseat products, I know I get quality. I recommend this seat to anyone who enjoys racing sims, but also to someone who's looking for a quality office chair. The office seat looks really good! It’s beyond what I expected in terms of build quality and looks. The black leather looks nice and the stiches are very straight. The seat is sturdy and stable, so you’re driving around your desk all the time. Only downside to me is the arm-rests, they are fine but they don’t have the same build quality as the rest of the chair. There is a little plastic feel to them. However, I’d recommend this chair to anyone who is looking for a good looking and decent office chair. I find this office seat very comfortable and balanced. The black look makes the office seat look very professional, yet the sporty design suggests sportmanship and speed. Great combination of two values my company wants to project to our customers. As a sim race fan I couldn’t resist to buy this chair when I needed one for my home office and I’m absolutely not disappointed. When my clients drop by, they all notice the chair and agree that it looks nice. For a very formally decorated office it might not be the ideal chair, but for me it is! 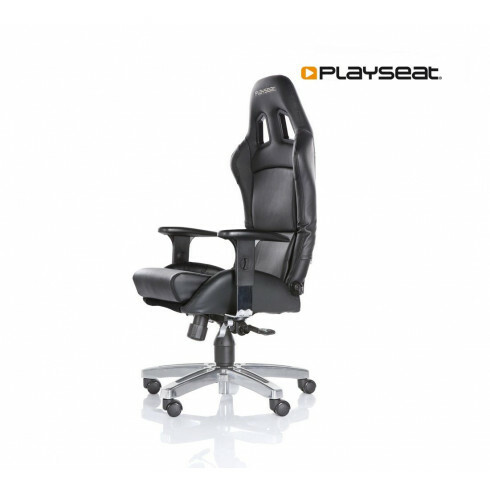 Why an office chair from Playseat®? Because it looks good, it’s of high quality and I like racing! Especially the sturdy base makes the office chair stable. Everything can be adjusted for the optimal position.